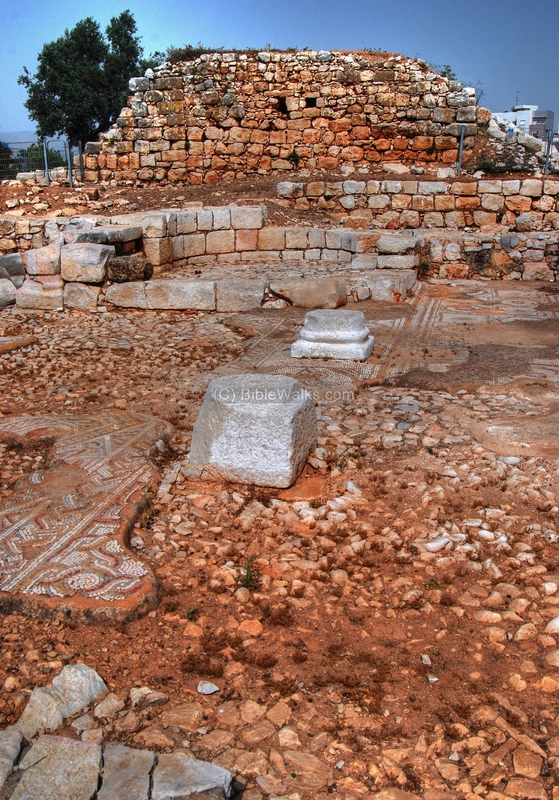 Ruins of a Byzantine monastery, located in an archaeological park in the west side of Karmi'el. Ruins of a Byzantine monastery and farm house, located in an archaeological park in the west side of Karmi'el. 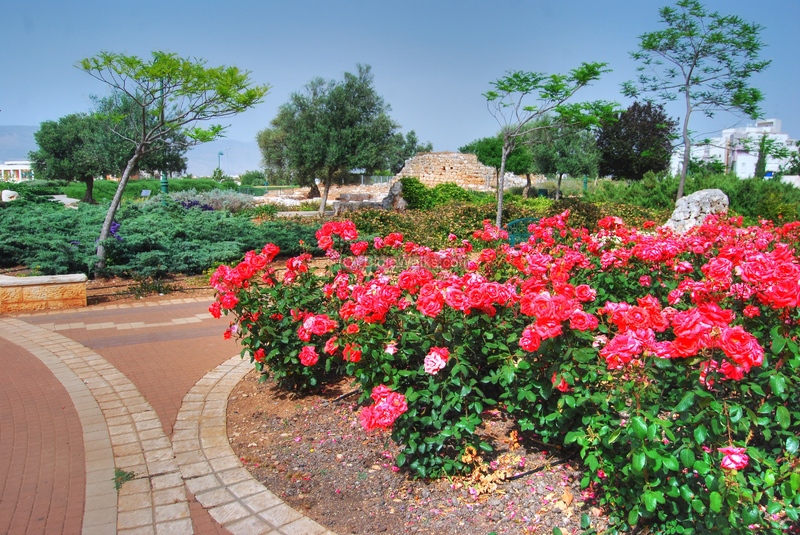 The reconstruction and integration into a well planned garden ("Park Rabin") is remarkable, and is a recommended site to visit. The site is located at altitude of 300M on the western side of Karmi'el, between high rising residential houses, along the Nesiei Israel boulevard. It is seen in the center of the map below. You can point on the purple points to navigate to the selected point. 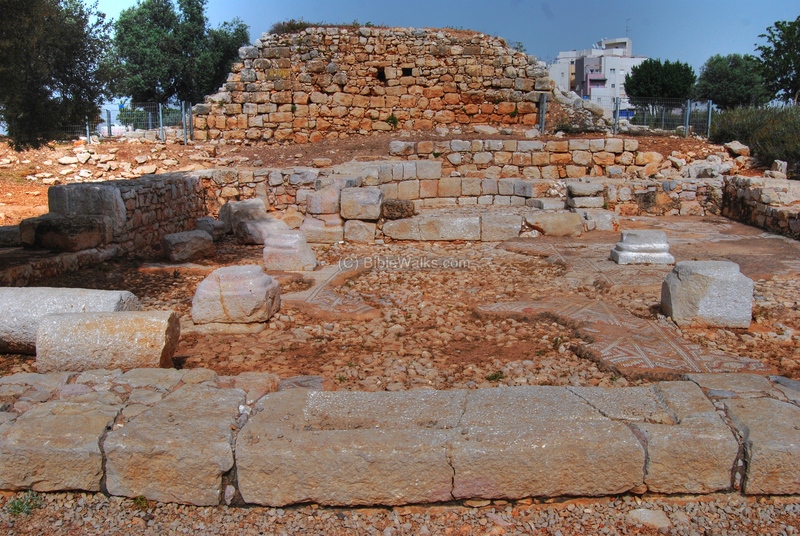 During the Byzantine period (5th-7th C) the area of western Galilee was mostly populated by Christians. 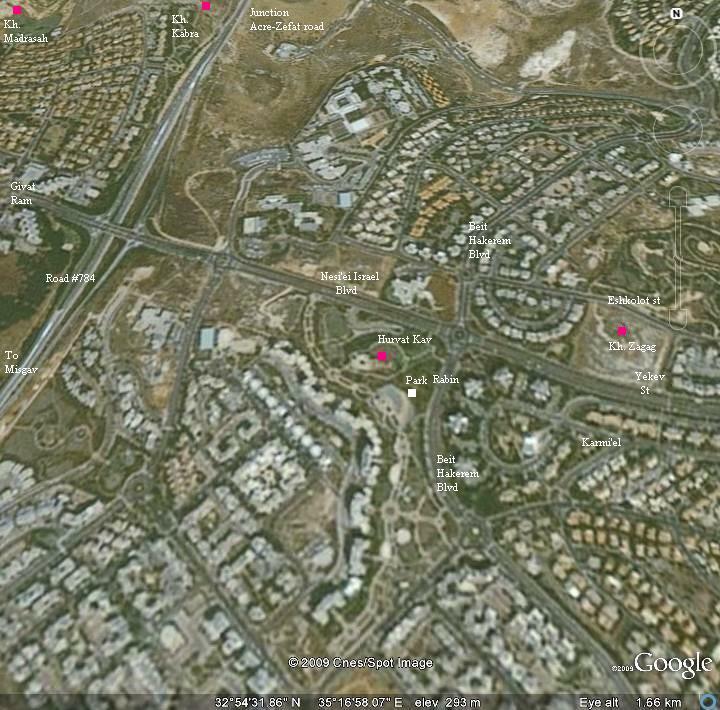 The area within the municipal area of the city of Karmiel was the densest in this region - a total of nine (!) Byzantine monasteries were excavated here or identified as such. 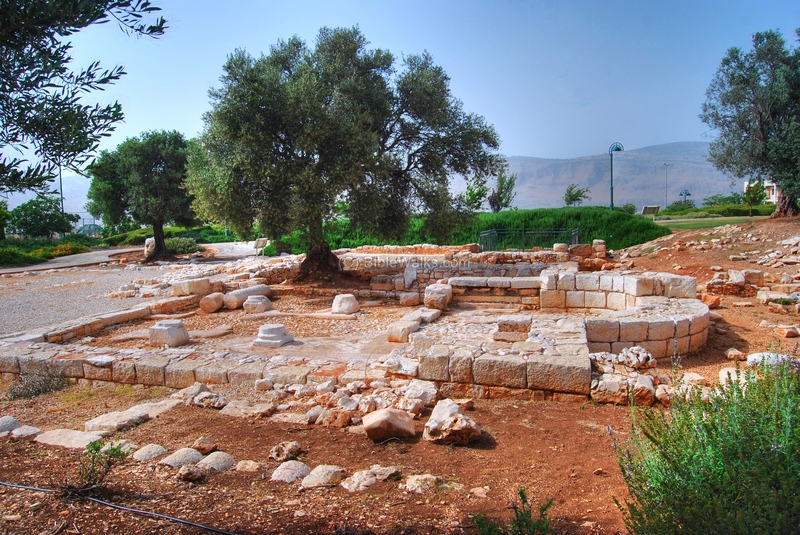 The site of Hurvat Kav was one of the Byzantine monasteries. It consists of a number of houses, a convent, and a large and well preserved wine press. 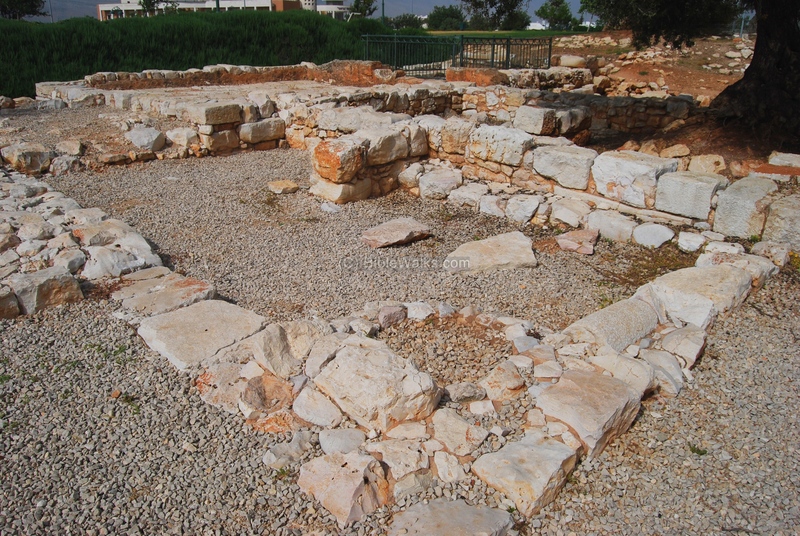 A Byzantine farm was located near the monastery. Most of the Byzantine sites were destroyed in the 7th C during the Persian or Arabic conquests. 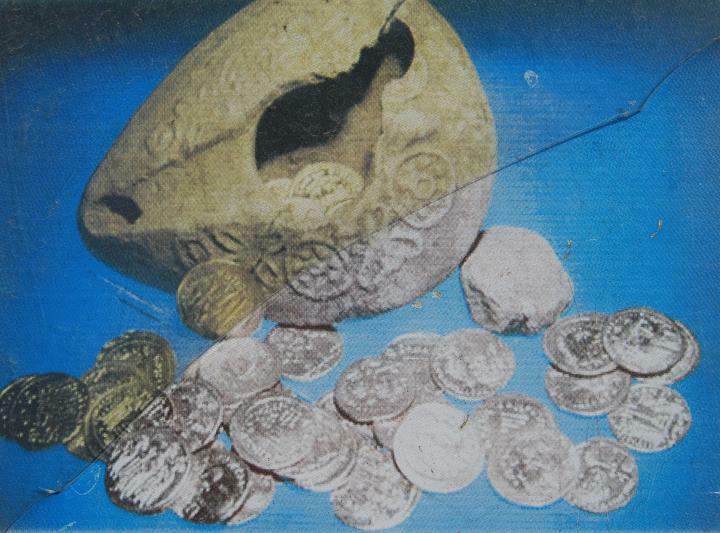 A hoard of coins found in Hurvat Kav revealed that site continued to operate several years under the Arab rule. After the Arab conquest the new residents occupied the structures. Later, the site was used for industrial purposes - a ceramics factory was established on the site. 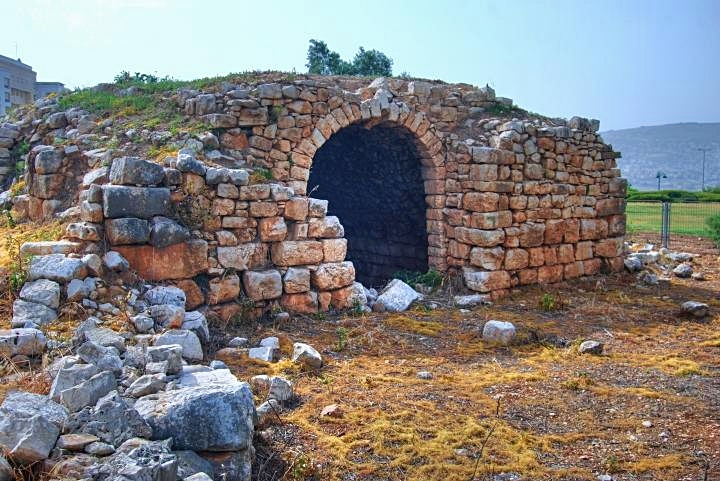 During the Ottoman period (16-20th C) an arched structure was built on top of the Byzantine ruins, giving the site its name - "the arched basement" (Khirbet el-Kabu) which was then translated to Hebrew, based on phonetic similarity, to Hurvat Kav (Kav is a Biblical measurement unit) . 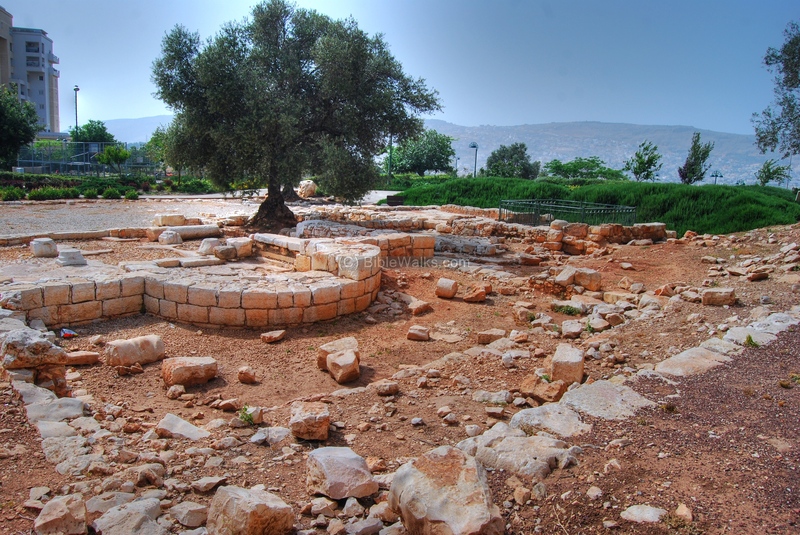 The arched Ottoman structure, a typical structure used in many Galilee sites, was reconstructed during the excavations. Karmiel was established in 1964, and has grew since then to a large and beautiful city with over 50,000 residents (2008). In 1990 the site was partially excavated during emergency excavations (Gurin and Stern). Later it was decided to convert the site to an archaeological park, and further excavations (2000) together with landscaping made the site a unique park (covering an area of 60 Dunams). 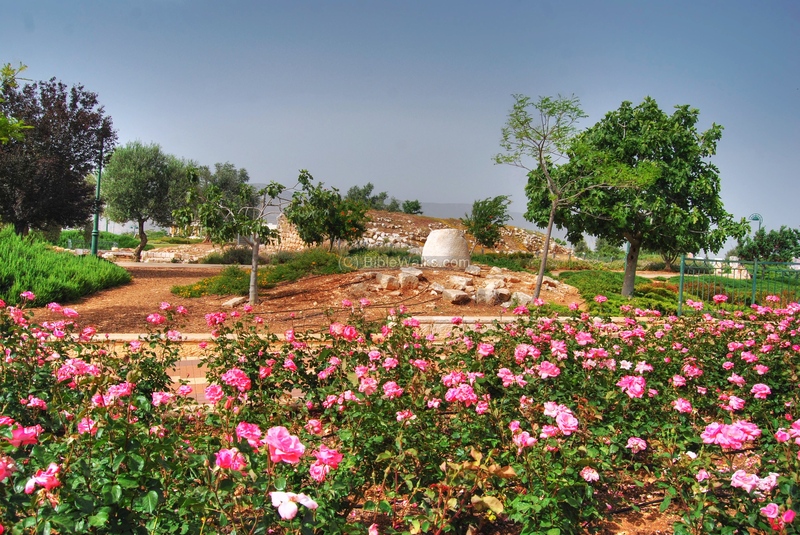 The park and the neighborhood were named after Itzhak Rabin. 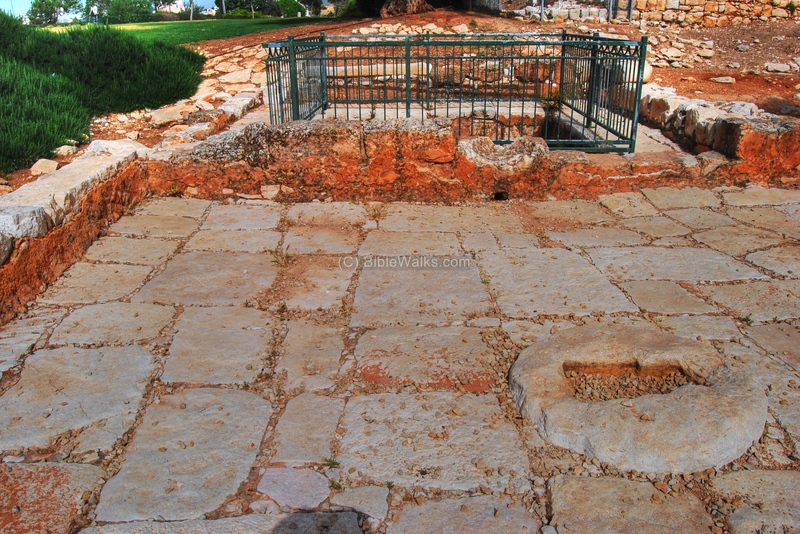 As an educational archaeological park, the site is maintained - as indicated by a sign - by the "HaReut" school of Karmi'el. The site is part of a large park, and is open to the public. The photo below shows a view from the west side. The large wine press is seen on the left side. The ruins of the church and monastery are seen on the right side. In the background is the Ottoman period structure. The photo below shows the modern residential buildings, built in the late 20th C, with the ancient Ottoman period structure. Although both use the arch as a dominant element in their design, there is a large leap between the architectures. In the center of the ancient site are remains from a Byzantine convent. The photo below shows the bases of these structures - a church in the center and rooms behind the olive tree. A closer view of the rooms on the north side is seen below. 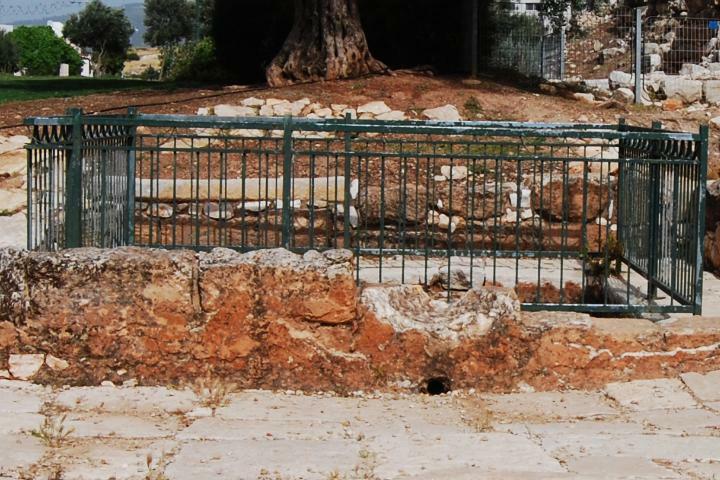 Underneath the floor of one of the structures, in the area of the grass on the north side, the archaeologists discovered a treasure: an oil lamp containing 50 Byzantine gold coins. The latest coin is dated to 641-668 during the reign of Constans II, testifying to the fact that the site continued to operate even after the Persian (614-616) and Arab (634) conquests, which destroyed most of the Byzantine sites in the Galilee. A small church served the monastery. 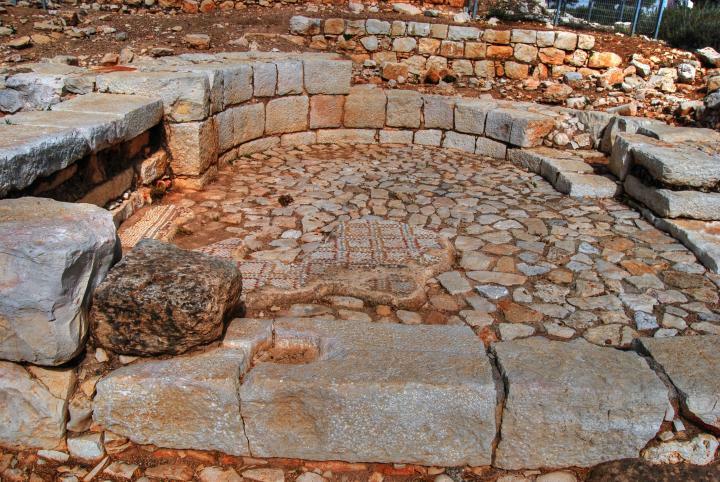 Its base and small sections of the mosaic floor and bases of its columns were reconstructed. A view of the church from the west side is seen below. The apse, facing the east, was covered with a mosaic floor. Another view of the apse is seen below. A section of the south aisle, with a mosaic floor and the base of a column. The floor was decorated with geometric patterns. 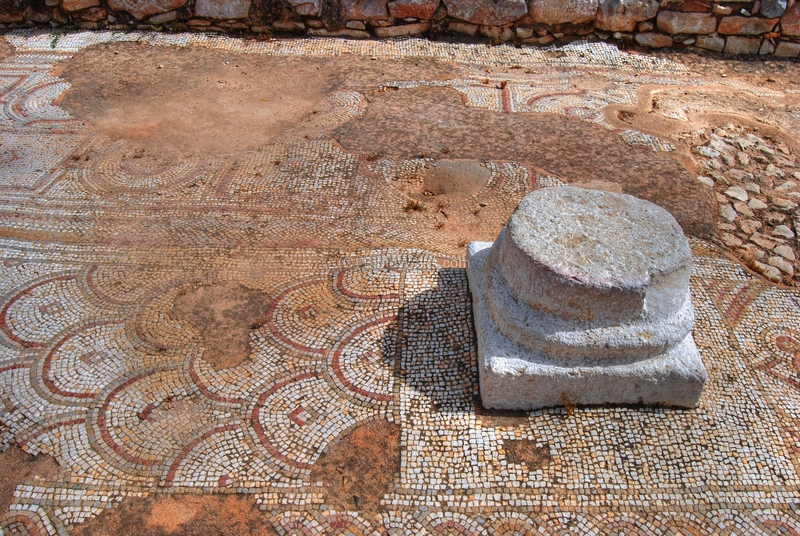 As seen in other early churches and at this site, 5th C churches are decorated only with geometric carpets, without figurative objects. The figurative decorations , such as floral, animal and village/hunting scenes, started only in the 6th C.
A large wine press is located to the north of the church. Wine production was a popular industry in the Holy Land, and was used by the convent as a source of income. 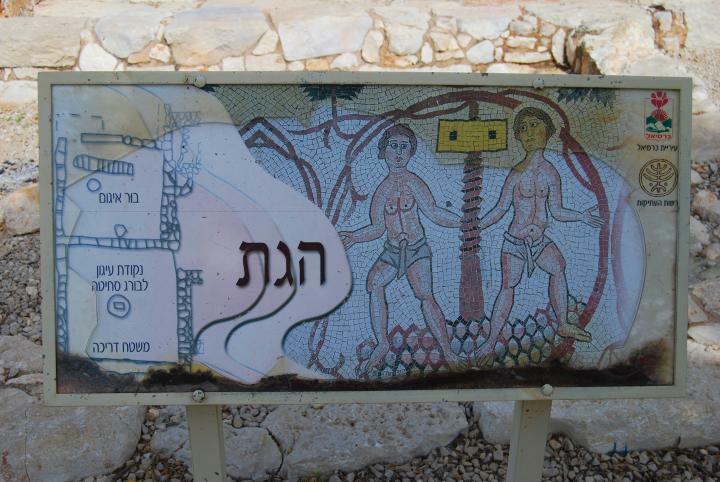 The sign below shows the plan of the winepress. In the photo below is a large treading (crushing) floor. The grapes were placed on the treading floor, and the workers would crush the grapes with their feet. The squashed grapes and juice would remain here during the fermentation process. The wine juice then would be let to pour thru a blocking/filtering groove into the collecting pit. A piece of bush or thorn was placed into the hole in order to filter the juice. 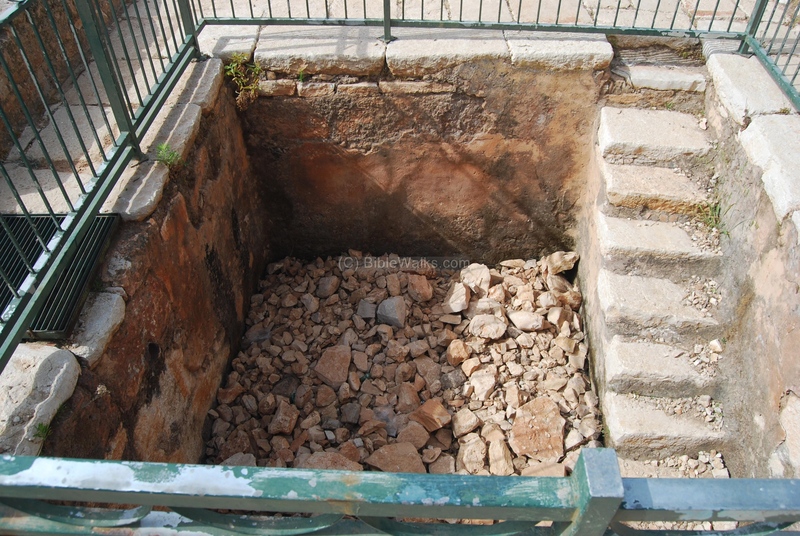 The photo below shows the collecting pit. A number of stairs lead to the bottom of the pool, allowing the workers to collect the juice and clean the pool. The juice was collected into jars, then stored for subsequent fermentation. Another element in the wine production is seen below. The hole in the center of the treading floor was used for secondary extraction of the juice, using a single fixed-screw press. The remains of the crushed grapes would have been collected into the hole. A crushing stone, fitting exactly into this hole, was used to crush the trampled grapes once again in order to extract the lower quality grape juice. An element of an oil press is located in the garden, as seen below. 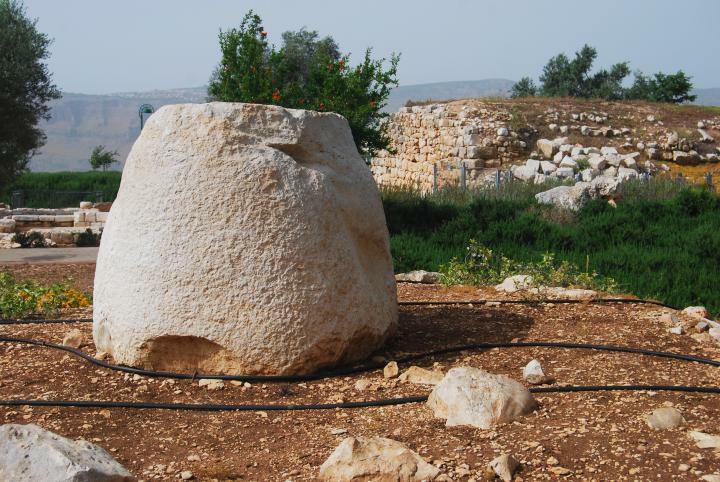 The large stone was used as weight to push down and press the crushing stone on the basin, in order to extract the juice. Another such stone on display in the garden is seen below. An ottoman period structure is located at the center of the site. The east side of the arched structure is seen below. 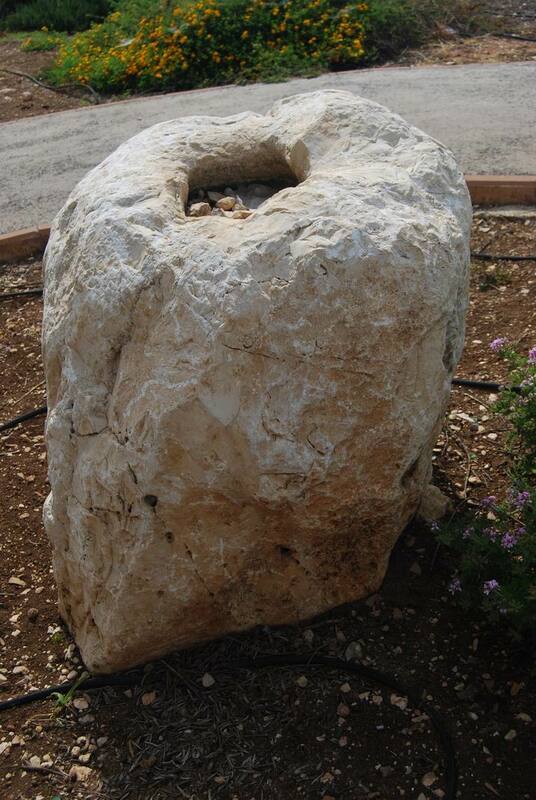 This is a typical design, found in many sites in the Galilee (Kh. Mehoz and Kh. 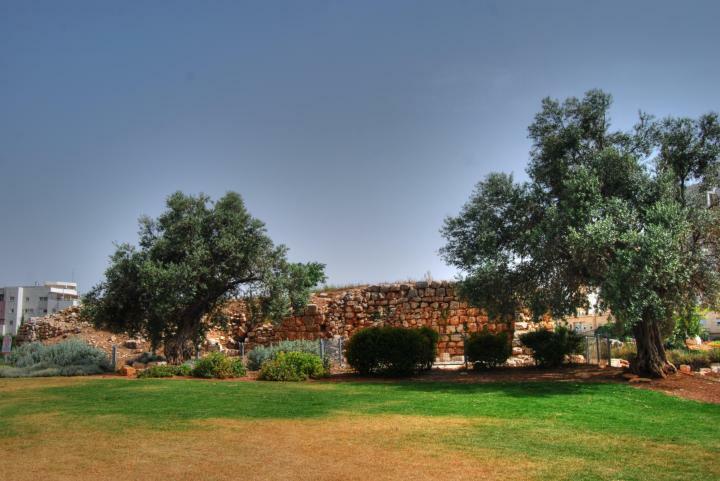 Beersheba-Galilee). The builders used the stones from the earlier structures. Another view from the north-west side is seen below. 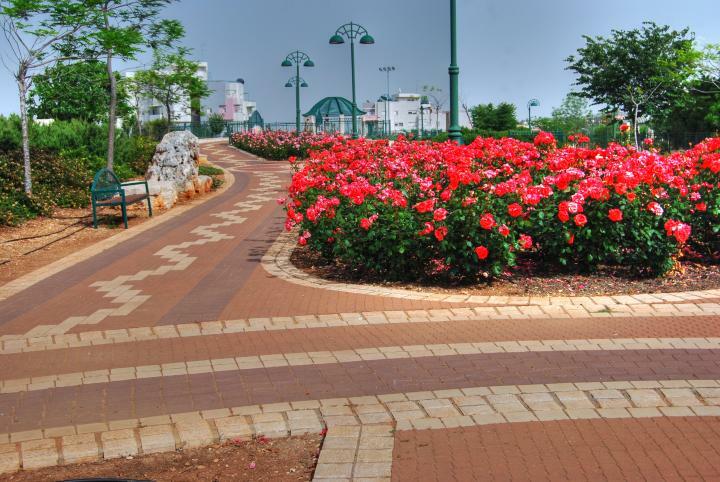 Park Rabin is a beautiful planned garden, with rows of roses between concrete-brick tiled pathways. Stylized gazebos, lamps and chairs add beauty to the landscape. Another view of the garden and the ancient site is seen below. 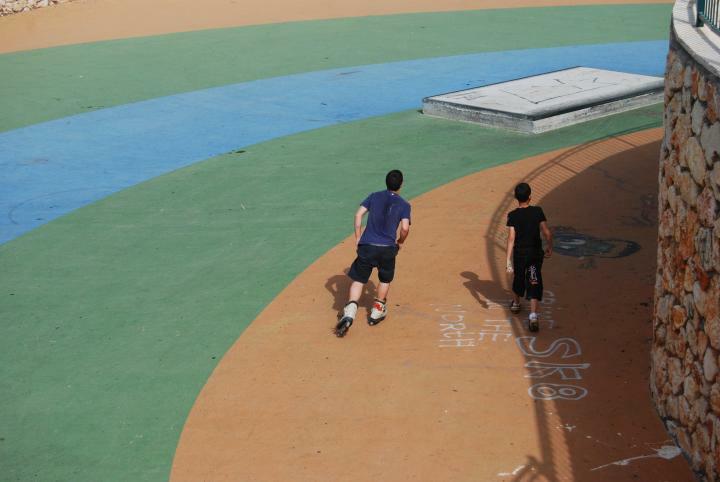 On the south-eastern side of the park is a roller skating rink. 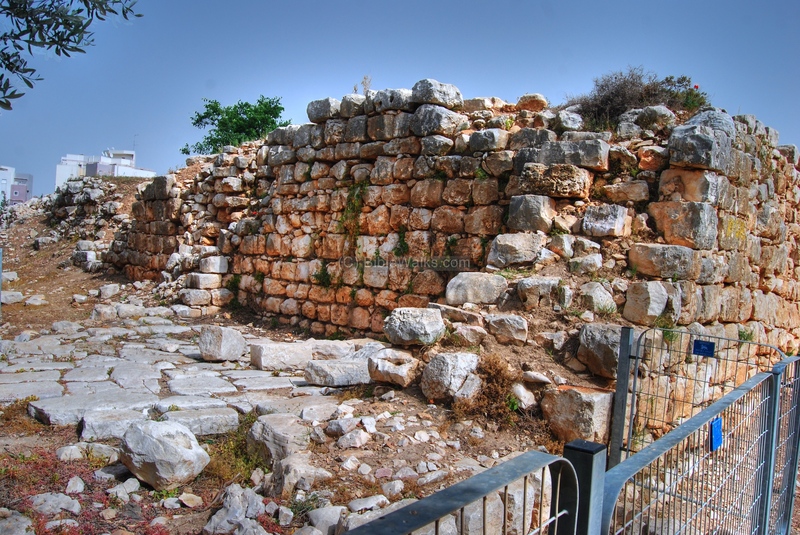 Aviam M. 2004: Jews, Pagans and Christians in the Galilee (Land of Galilee 1). Rochester. Pp. 181-204. Kav (Qav) - In the Hebrew Mishna (2nd C): a measurement unit, equaling to 1.3liter. The Hebrew name of the site is modern, based on the Arabic name. el-Kabu (Qabu) - The name of the site in Arabic - "the curved basement", named after the Ottoman structure on the site. Hurvah, Harvat - Hebrew: ruins (Arabic: Khirbet). Based on the root word "Harev" - ruined. Beit Kerem (Beth Cerem) - Hebrew: House of the vineyard (or olive grove). 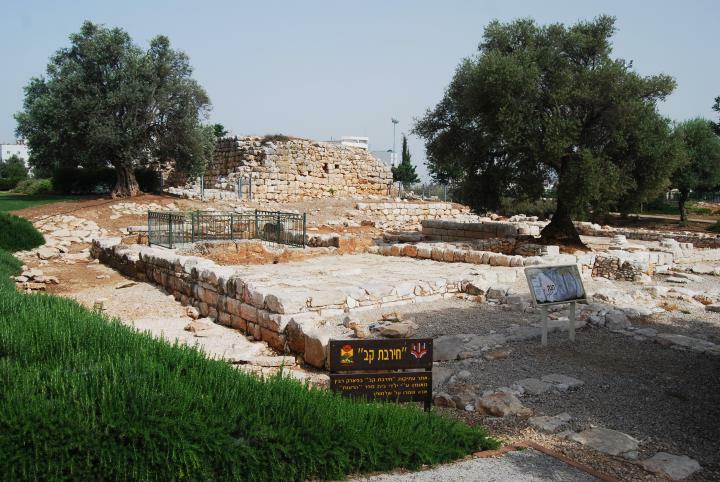 In Jeremiah 6:1 there is reference to another site near Jerusalem with the same name"... and set up a sign of fire in Beth Haccerem: for evil appeareth out of the north, and great destruction". 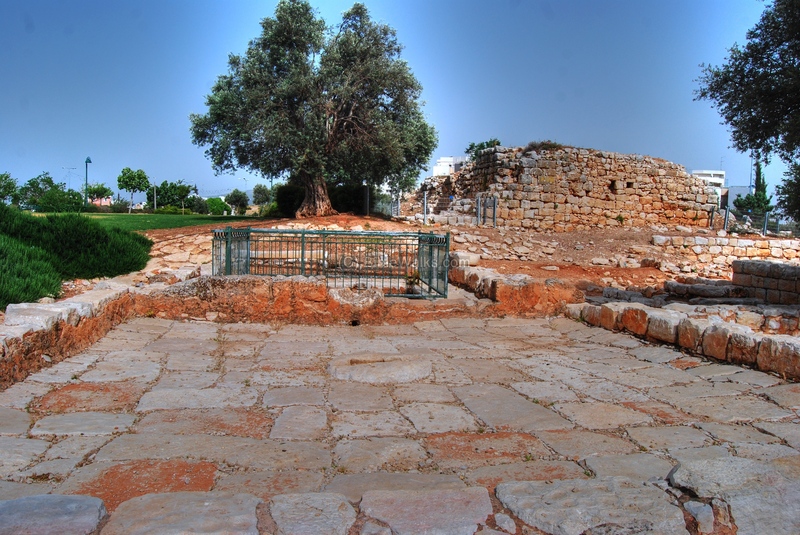 Karmi'el (Carmiel) - Hebrew: Olive grove (Kerem) of God (-EL). Kerem means also vineyard, so the name also can mean "Vineyards of God". 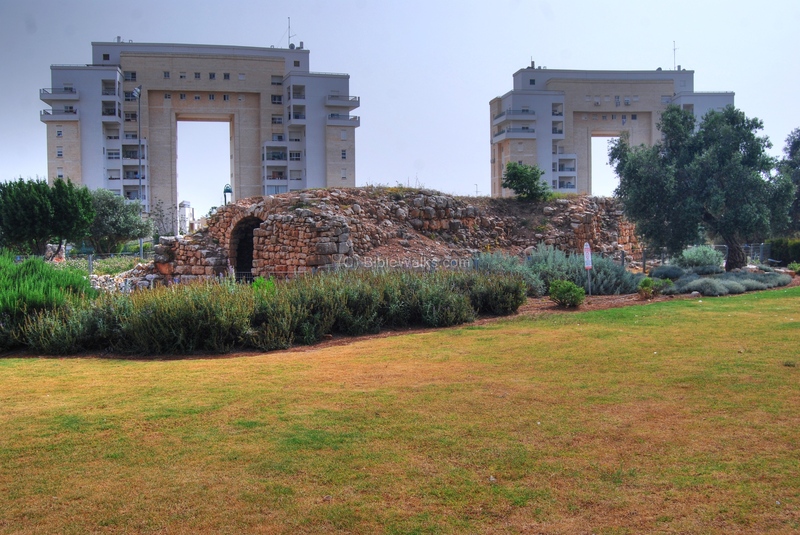 The city's name was based on the name of the valley - Beit Hakerem.